The North Backbone trail is pretty tough to get to. The location of the trailhead is dependent on the road conditions on Blue Ridge Road. Blue Ridge Road is a rough dirt road that spurs off Highway 2 near Vincent Gap. The road passes through Mountain High Ski Resort and straddles the ridgeline as it heads east into the mountains. There are plenty of bumps in the road, and depending on the type of car you drive and the conditions you are comfortable driving in, it may prove to be a bit too adventurous. Our Subaru Outback performed admirably, and I saw a few passenger cars drive the road as well. Just make sure you give yourself plenty of time to maneuver your way down the road. Blue Ridge Road goes all the way past Wright Mountain, where the trail junction for the North Backbone trail is. Unfortunately, on our visit the road was closed at Guffy Campground, adding a couple miles of hiking in each direction. Fortunately, the PCT runs adjacent to the road and acts as a nice warm up for the hike. Due to the remote location, this section of trail is nice and empty despite it being a pleasant, flat tromp through the woods. Since Guffy Campground rests at 8400 feet, the air remains relatively cool for a summer hike in SoCal. About halfway to the trail junction near Wright Mountain, the trail intersects with the Acorn Trail. This trail starts in Wrightwood, and offers access to the area for people who want to avoid dealing with Blue Ridge Road. Taking this route adds over 1,000 feet of elevation gain to an already brutal hike, so keep that in mind. Shortly after passing the Acorn Trail junction, Pine Mountain and the Backbone trail come into view. It’s important to keep an eye on the topography here, since the trail is hardly marked. Near the top of Wright Mountain, there is a faint use trail that moves down the hill from the PCT to Blue Ridge Road. At the road, there is a small white sign attached to a tree marking the trail. This is where the trail transforms from a hike into an adventure. The elevation at the trailhead on the road is at 8310, and the summit of Mount Baldy is at 10064. So, with a cursory examination of the route, it is easy to mistakenly assume that is a relatively easy trip to the top. 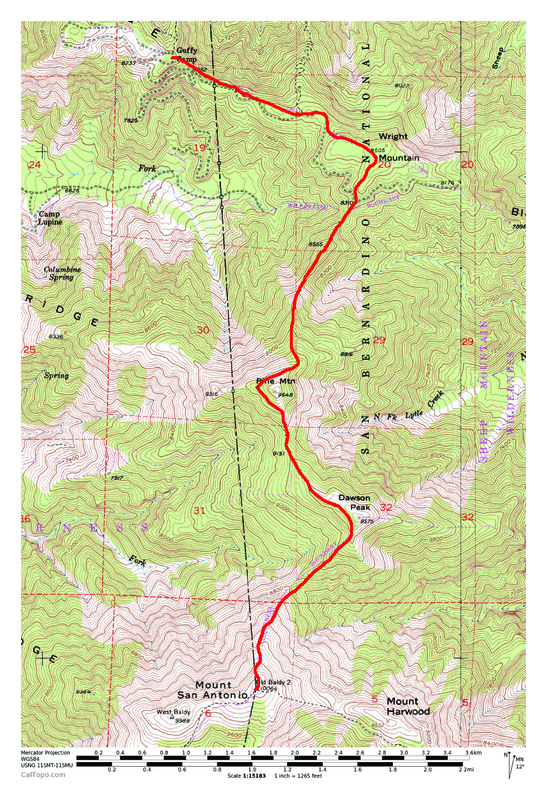 This is why it is important to study a topo map before heading out on a hike, because this trail is anything but easy. The route stays true to its name by staying on the backbone of the ridge for its entire length, and as a result, it descends down to a series of saddles between each high point. This becomes immediately clear as the trail immediately descends 150 feet down from the road, ascends up 400 feet, and then descends 100 feet down to another saddle. Less than a half mile down the trail and already 250 feet of unnecessary elevation gain. Ugh. Heading down to the second saddle, the trail can be seen ascending up the next ridge. On our visit, I studied the ridge while thinking “there is no way that is the trail.” Needless to say, the trail here is excessively steep and exposed. In the Trail Stats section, I said that this trail is not exactly dog friendly. This is why. This trail should only be attempted by seasoned hikers, and that includes dogs too. Callie is a special dog with hardened pads, agility training, and enough experience to tread safely on the trail. The loose scree covering the path, along with the long steep drops on both side of the ridge, makes it important to move with extreme caution. Trekking poles are highly recommended. The lack of switchbacks causes the trail to ascend altitude at a brutal pace. If this doesn’t get your legs burning, then not much will. Eventually, the ridge levels off and the trail returns to a manageable grade as it approaches the summit to Pine Mountain. From the summit of Pine, Dawson Peak and Mount Baldy, along with their respective saddles, come into view. The trail then descends about 330 feet down to a saddle before ascending back up 350 feet to the top of Dawson. Some parts of the trail here are overgrown with Mountain Whitethorn, so pants are recommended to keep your legs from getting scratched up. The dip between Dawson and Baldy is even worse. The trail descends down over 700 feet to the saddle between the two peaks, and by this point all of the ups and downs have added well over a thousand feet of redundant elevation gain, which of course gets doubled on the way back. From the last saddle, the trail heads up relentlessly to the summit of Baldy, gaining 1280 feet in under a mile. Fortunately, it is in better shape and the route is far less exposed. A trail going directly up a steep slope never seemed so nice. Mount Baldy is a fine summit, and one that is very popular among Southern California residents. Chances are that you will see many more people when you reach the summit then on the entirety of the hike on the North Backbone trail to get there. Maybe you’ll see Callie too! This was her fourth Baldy summit. The North Backbone trail is typically only accessible during the summer months, which means that the view from the Baldy summit is a crapshoot. Often, the view looking towards the expanse of Los Angeles is pretty hazy, which is one of the main reasons why we prefer hiking the San Gabriels in the winter. The descent from Baldy starts out with a sweeping view of the area. Baldy is high enough to look over the 8,000 foot ridge to the north to expose the seemingly endless expanse of the Mojave desert. Mount Baden Powell, Pine Mountain, and Dawson Peak dominate the foreground. While there is no immediate danger here, the trail is so steep and loose that it is pretty difficult to keep your balance. Again, trekking poles come highly recommended for this trail. It’s mostly easy going until you get to Pine Mountain though. The new views on the return offer plenty of glimpses into the interior of the mountains and the sense of isolation is unmatched considering the proximity to Los Angeles. The final push up to Pine Mountain on the return hike is like a twisted joke. The steep trail of redundant elevation gain would normally be enough to get you gasping for air; put it on the tail end of this nonstop roller coaster death march and it will seem like it never ends. Thankfully, it eventually does. Now, the fun part! The incredibly steep, loose, and exposed trail on the north side of Pine is considerably more sketchy on the way down. One slip could result in disastrous consequences, so it is important to take it very slowly. Since fatigue is likely going to be a factor at this point, it is also important to make sure you are well rested before tackling this stretch. Once the trail finally levels out, it is sweet relief. The final couple miles back to the car feels like a moving walkway after the harrowing stretch of trail down Pine Mountain. It’s important to make sure that you get off the trail before it gets dark out, since that last stretch would be even more dangerous at night. If you time it right, you can experience the sunset over Mount Baden Powell as you drive down Blue Ridge Road. It’s a beautiful view of the mountains without a human in sight, right on the doorstep of LA. Not a bad way to end a dayhike in America’s second biggest city. I’ll bet Callie was wondering where the snow was! I right clicked the photo of you looking up at her at the edge of the cliff. Fantastic shot. Beautiful and touching photos… I can sense the remoteness from them. Also great description and detail of what’s ahead. I appreciate it. Someday I will follow your suit. Wow! Best pics and just overall description of Pine Mountain. There is virtually no info on this trail, but im guessing its because of its remoteness. Ive done Angels landing and this trail kinda reminds me of it, well just the exposed parts. Definitely going to try it this weekend.